Test of Faith | "Northern Crossings"
The first of an occasional series by JEAN HOPFENSPERGER with beautiful photos by LEILA NAVIDI was put out by the Star Tribune back on July the 8th. Called “TEST OF FAITH – THE UNCHURCHING OF AMERICA”, it was a rather depressing view of what some of us have been trying to get people to see for years and that is that the church is not only changing and declining, it is dying. Of course from a theological perspective we have to remember that Christ is the Lord of the church and sometimes dying brings new life. The beautiful pictures from Navidi are heartbreaking in that they show what many of us have been talking about for a long time and that is the fact that “back in the day” churches invested in plant and equipment that was meant for the comfort of the faithful and to house and care for members who have now declined to the point where the debt for the sanctuaries cannot be maintained. Big churches were built that house fewer and fewer folks. Evangelism was primarily a method to get folks into the pew to pay the bills. As someone said a while back, that is not how you run a church; that is how you run a casino. For rural areas the same applies. Beautiful little churches in the country that were built with love and care slowly faded away as the rural economy ebbed and flowed and the church families moved away and left only the elders (not “elder” elders, but the old). Farm families that had seven or eight kids grew the churches until the kids had to move away and the only thing left was the church, the parents and perhaps one child who now ran the farm. These were family churches and folks who were not in the family never quite took to them. So now we are at the point where New folks moving into the area are basically pagan and even the folks remaining come to church sporadically. One in four members today are in church every Sunday. There is a particularly sad story of one congregation that decided to close the church and sell the property in order to take care of the cemetery. There was a turning point about 35 years ago that some of us made a big deal out of and most reacted harshly to our reactions. There seems to have been a general mood that developed for large gifts and memorials given, not to mission and ministry, but for perpetual cemetery care. It seems surpassing strange to me that someone would give the mammon saved over a life time of toil and labor to mow the grass over a grave of which your body is a temporary resident. I can imagine the saint at the resurrection of the just rising, facing the East, seeing with new eyes the roiling rolling glory of the coming of the Lord of Lords and the King of Kings, and saying “I gave $100,000 for the perpetual care of this resting place and they could not keep the quack grass off of the headstone”. For some the decline puts us back to the days of the early Christians and it is kind of exciting. It may be a chance to reclaim what the church is constructed to be according to Paul in the letter to the Ephesians. For others it is a frustration because many have been saying that this was coming and should be prepared for. They are modern day Cassandras who are cursed with seeing the future but unable to convince others of what they see. Wandering around and saying “I told you so”, are not attractive actions in todays world. There is another vignette that brings out the “snarky” in me. 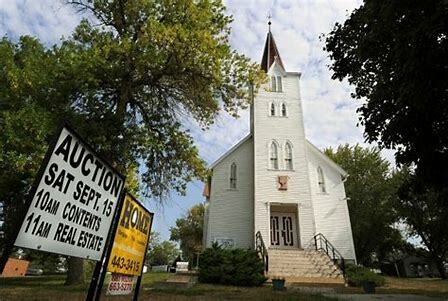 One of the churches in the article is being sold to become a “performing arts center”. In my mind one of the reasons for the churches decline is that many churches became, rather than the dispenser of the means of grace, a performing arts center anyway. When the place that is meant to give away and proclaim God’s gifts in Christ is turned into a concert hall and a social center for a select few the end is near and the social use that many wanted becomes a reality. I don’t usually recommend newspapers but I would recommend that you watch for more of this occasional article in the Star Tribune. The reason is not so much for the articles or the beautiful pictures but for the reaction of the public. You have to have a strong stomach but the glee with which many Minnesotans greet the news of church closings and declining faith is stunning. It is the end of the Christian America that so energized so many of us that is the energizing force in the lives of many today. There is a political and a theological reason for this and Minnesota and North Dakota have historically shown both sides of a strange coin – historically strong religious faith, and a propensity to ignore the tenants of that faith for political expediency. PreviousBeverly Olson – 32 years of service.